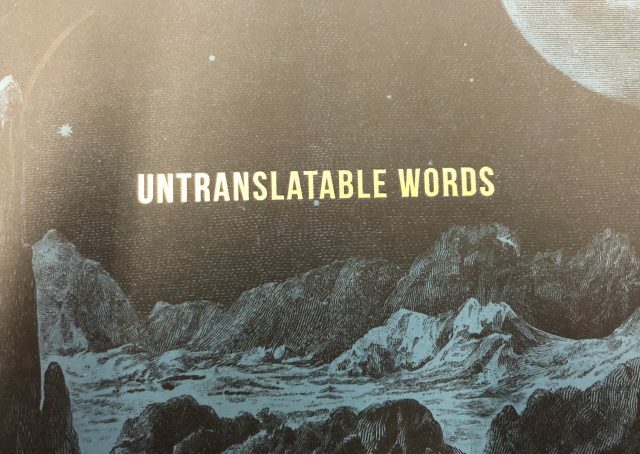 During her pre-audition visit to LA’s Museum of Contemporary Art, Lee Anne picked up a box of Untranslatable Words (20 cards of Perfect Words from Other Languages). We’ve decided to feature one of them on each day of this 2019 Season Audition Tour. Check back here or on the WTO Facebook page for updates! The feeling of solitude, being joyfully alone in the woods and feeling deeply connected to nature. Amazing how many of this set of Untranslatable words are common currency in our world of opera and art song. Concepts like WALDEINSAMKEIT and its cousins are embedded in the DNA of us who have spent any time in the world of German Lieder. I won’t deny that it’s restorative being back home, doing auditions in the middle of the Vienna (VA) Woods. Describes a place where we feel safe, a ‘home’ (which doesn’t literally have to ve where we live) from where we draw our strength and inspiration. God bless you road warriors out there. We’ve only been on the road for three weeks, and we’re in serious need of QUERENCIA. Not just the place we call home, but the people who await us there. If you’re going into this career, please do not underestimate how important it is for you to carry a bit of your QUERENCIA with you wherever you go. A heightened state of emotion created by a moving piece of art. No commentary needed. We just need more of this in our lives. The satisfaction we find in another person’s failure or suffering. OK, I can’t even get preachy about this, because Steve Blier programmed “Schadenfreude” from Avenue Q as the encore in his recital at Wolf Trap last May, and I can’t think about it without giggling. Gives a name to a mood in which one feels that the universe as a whole possesses a mysterious, elusive, but real, beauty. We’ve all had those transcendent moments. Science will probably eventually explain to us that they are completely attributable to biochemical bodily processes that tweak our nerve endings and brain synapses in just the right way. But until then, I will believe that art can bring about YUGEN, that music can create its mysterious and elusive beauty. A bitter-sweet melancholic yearning for something beautiful that is now gone. There is pain, yet also pleasure that such loveliness once graced our lives. I know almost no Portuguese, but Steve Blier has included enough Portuguese songs in his Wolf Trap recitals to teach me about SAUDADE. A perfect entrant in this Untranslatable Words collection, it is such an essential ingredient in art and life. Literally: gate-closing panic. The anxious claustrophobic feeing that opportunities and options are shutting down; that you have missed the boat, you have to get a grip, you are getting too old. Oh my, does this hit close to home. I feel it in a cosmic way from where I sit in my 60’s. But our auditionees feel it almost more keenly at the beginning of their careers. How long can you be a “young artist?” What happens when the career momentum doesn’t do what you need it to do in that brief window of time? Claustrophobic doesn’t begin to describe TORSCHLUSSPANIK. I have no answers to those rhetorical questions. But I do remember that when my German friend Thomas Lausmann was one of our audition panelists, he would regularly intone “Keine Panik” throughout the audition day. Let it be your mantra. The gloomy feeling that things are in decline and that the situation will probably get gradually worse. Despite the darkness, there’s a joy in having the word to hand, sparing us from a personal sense of persecution. Let’s step aside from the global/political tones of this definition and look at it in context of what we’re trying to do here during this audition season. There’s a great freedom in knowing that things could be worse. And sometimes when they actually are (who has completely biffed a performance lately? ), there is great relief and joy in the aftermath. The humiliated despair we feel when someone accidentally reminds us, through their accomplishment, of everything that has gone wrong in our lives. Literally translated as ‘go with me.’ Used in reference to a book that – like a friend – is a wise, helpful and constant guide through life. The term originally refers to a book, but given our context, let’s customize. What work of art is like your best friend? Guiding you wisely and compassionately through life? What do you return to again and again to be inspired? What gives up new lessons at every turning point in your life? A painful face everyone is aware of, but which – out of compassion – no one mentions. There are many kinds of elephants in rooms. Recent events in our industry and across the culture have reminded us that some of them demand to be named. Any time someone is harmed by an act that has been shoved under the rug, nothing should remain unspoken. But true MOKITA that comes out of deserved compassion for someone who has suffered – well, that can be a gift. The deepest kind of fulfillment. It’s accept that it can go hand in hand with lots of day-to-day frustration and pain. An over-arching sense of happiness that transcends day-to-day frustrations. Sign me up, please. Let’s cultivate some EUDAIMONIA this audition season and bid it carry us from periodic success to momentary failure and back again. A refined, elevated and appalling kind of boredom. One is bored not by a lack of appealing stimulants but by the very things that are supposed to be interesting: creativity, wit, intelligence, history, the universe. What in the world would cause someone to be bored by creativity, wit and intelligence? Saturation, I would posit. Not matter how good a thing, too much of it can backfire. Or at least that’s my story for today, as we take a day off from the singing and flying. To avoid the risk of TOSKA (no relation to its famously exciting never-boring Roman friend Tosca, obvs…), we pause and reset. An acute sensitivity to the transience of lovely things; a melancholy awareness that everything nice will fade combined with a rich enjoyment of this short-lived beauty. Contemplation of the fact that dust used to be other things – the walls of a city, the chief of the guards, a book, a great tree: dust is always the ultimate destination. A traditional break from work usually involving a drink of coffee or tea. In Swedish offices, you are strongly expected to take a FIKA, no matter how busy you are. We try to be good about incorporating FIKA (what’s the plural???) into our audition days. Tough for workaholics like us, but it’s a necessary discipline to step away from the opera. And yes our FIKA usually involves coffee. But it just as regularly includes down dog, headstands, and (in the cities where Joseph Li is on our panel) planks and push-ups. If we look a little flushed when you sing an audition after our break, just know that we got the blood moving. All the better to hear you with! The euphoric feeling at the beginning of love. We can’t believe someone so perfect has wandered into our lives. Otherwise known as Act I of any romantic grand opera. Mimì and Rodolfo, Manon and Des Grieux, Violetta and Alfredo. And on and on. FORELSKET is where it all begins. A feeling of edgy anticipation that makes one keep on looking out the window to see if an unexpected visitor is coming up the path. Anticipation, edgy and otherwise, is the watchword for Day 1. The totality of next summer will begin to unfold itself over these next 3-4 weeks, and our ears are looking out their aural windows to identify unexpected talented visitors. If you do this, you must provide a link to a video clip with both of you pronouncing the word. Maybe also tell us what language it is. You need to tell us the language that these words come from. Please drop my comment. I had not read closely the initial comment.